Tony Carr has overseen the development of so much English talent that he must be near the top of Fabio Capello’s Christmas card list. 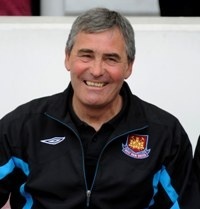 In his 37 years at West Ham United - which has seen him progress from part-time youth team coach to Academy Director - Carr has helped nurture the careers of England regulars Rio Ferdinand, Frank Lampard, John Terry and Glenn Johnson, whilst Jermain Defoe, Michael Carrick and Joe Cole also spent their formative years under Carr’s tutelage. After almost four decades in charge of one of English football’s most prolific production lines, Carr is being rewarded with a testimonial game next week, when an ‘All Star’ team of his academy graduates will take on the current West Ham team at Upton Park on Wednesday 5 May. Club Website will be catching up with Tony this week in the build up to his big game and we want to give you the chance to put your questions to him. So, if you'd like to ask Tony a question about his time at West Ham, the talent that he's helped to develop or the secret to being a great youth coach, now's your chance! Thanks for all your questions - please don't post any more as we won't be able to put them to Tony. A round-up of the interview will be published shortly. Carr has lined up a stellar cast of his star pupils to form his All Star XI. He has spoke to all of the players concerned and all have agreed to play, subject to their respective club manager’s decision. Images courtesy of West Ham United FC.